The format of this review has been slightly shortened as the Pentax K-r is operationally similar and identical in terms of output to the Pentax K-x that we reviewed in December 2009. We tested to confirm the image quality is identical, then concentrated the review on the differences between the two cameras. To learn everything about the K-r we recommend reading not only this review but also the full review of the Pentax K-x. 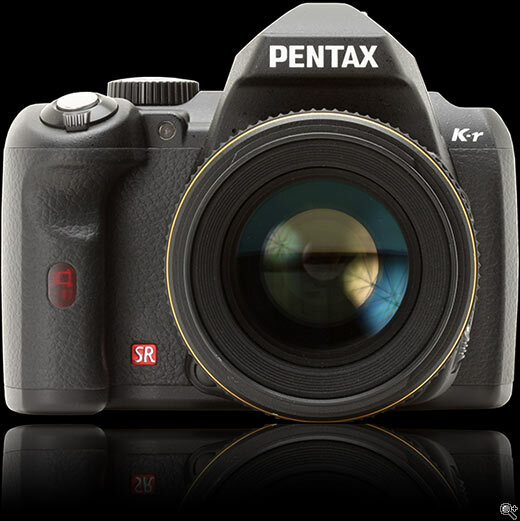 The K-r was announced in September 2010 and slots into the Pentax line-up between the entry-level K-x and the enthusiast models K-7 and K-5. Visually it is much closer to the K-x but a look under the hood reveals that the new model has been improved over the K-x in various areas. Most notably the K-r shows the active focus point in the viewfinder when the shutter button is half-pressed. The lack of this feature was one of our main points of criticism of the K-x and K-m (this is also almost certainly the reason why the K-r's prism is slightly larger than the K-x's). Like the K-x the K-r captures its images and 720p video footage on a 12.4 sensor, but like on Pentax's semi-pro models the output and menus can be viewed on a 3.0 inch LCD screen with 921k dot resolution. 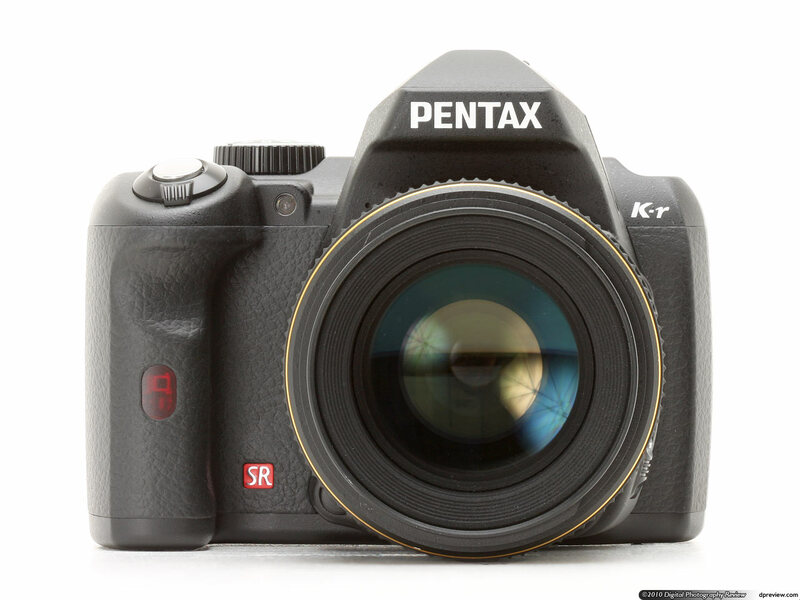 Additionally the K-r offers, after the K-5, the second widest ISO range (100-25600 in extended mode) and second fastest continuous shooting (6.0 fps) of all current Pentax DSLRs. Compared to the K-r the new features also include an IR simple interface (wireless data transfer to compatible devices), a cross processing mode and a Night Scene HDR mode. For those photographers who cannot decide if they prefer AA batteries or a proprietary rechargeable battery as their camera's source of power the K-r offers both options. It comes with a rechargeable battery as standard, but AA batteries can be used with the help of an optional adapter. Apart from the dual-battery feature the Pentax K-r doesn't really offer anything totally new or out of the ordinary, but the specification sheet does look quite strong for a camera at its price point, and makes it look (at least on paper) like a more than viable alternative to some of the competing models from larger manufacturers. Just Posted: Studio Samples from the Canon Rebel T3i/EOS 600D and Pentax K-r. We're working away on a series of enthusiast-level DSLRs at the moment and have just finished processing the shots from our standard studio scene. Both cameras have been added to our comparison tool and can be accessed from all of our recent reviews. We've added a couple of comparison pages to our Rebel T3i / EOS 600D preview that pit the two cameras side-by-side and against two of their peers. Pentax has released firmware updates for its K-5 and K-r digital SLRs, and 645 medium format camera. The latest update for all cameras extends compatibility to SDXC memory cards. Version 1.02 for the K-5 and v1.01 for K-r also brings improvements to the Contrast AF operation and Bulb mode shooting. The latest firmware versions are available for immediate download from the company's website. Pre-Photokina 2010: Pentax has announced the K-r, its latest mid-level DSLR. Initially sitting above the K-x in the range it offers more angular, K-7-esque styling. It offers 6 fps continuous shooting and HD movie recording and regains AF-point illumination in the viewfinder. It also features a high-res 920k dot (VGA) LCD display and the ability to shoot at up to ISO 25600. Unusually for a Pentax at this level it uses an rechargeable Lithium Ion battery pack but can be used with AAs via an optional adapter. We've had a chance to get to grips with the K-r and have prepared a brief hands-on article discussing its features and additions.